It is the key phrase of a telephone interception among some ‘ndranghetists in the aftermath of the fall of the Berlin Wall. This conversation was reported by regents and scholars of the phenomenon almost as if it were a legend. In fact, the team of investigators coordinated by Bernd Finger, for almost thirty years at the head of the section dedicated to the fight against organized crime of the German police, marks the beginning of the awareness by the German authorities of the Italian mafia presence. « Italian mafia arrived in Germany in the 70s along with the illegal workers and stayed since then.». 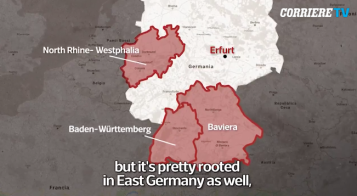 – expains Margherita Bettoni, co-author of the essay Die mafia in Deutschland – « Mafia is mainly present in the economically strong regions of Germany : Baden-Wuttenberg, Bavaria, Essen, North Rhine-Vestphalia and is also very strongly represented in Eastern Germany, for exemple in Turingia, in the city of Erfut. Some zones are strongly contaminated such as Algovia, in South Baviara, Monaco, Stoccarda, Frankfurt and its surrondings. The strongest mafia in Germay at the moment would be ‘Ndrangheta. The german territory can almost be divised in two parts : there is a North-south axis on which rules the Farao clan and a East-West axis on which the San Lucas clans are ruling.». On 16th of August 2007 was sounded the alarm about the presence of Italian mafias in Germany with the slaughter of Duisburg when, during a ‘Ndrangheta’s feud, 7 persons were killed. For the first time in Germany, the public opinion perceived the presence of Italian mafias. In the following years, various police operations were done, with the identification of clans’ cells. One of the last police operation, done following the order of the Procurator of Catanzaro was called “Stige” and brought to the arrest of 169 persons. “These last decades, they didn’t want to understand – accused Nicola Gratteri – because personnaly, 10 years before the slaughter of Duisburg, when I came to Germany and they made me listen to wiretapes in which the mafiosi talked about “places”, I told them a”place” wasn’t a shop. It was the organisation at the base of the ‘ndrangheta ad I clearly told them : “In 10 years, you’ll have the same problem we currently have in Italy”. Unfortunately, Germany wasn’t equipped for it on the normative plan”. Click here to see the video in English. To see the previous episode of MafiEurope in England, click here. This entry was posted in Economy, Europe, Human rights, Illegal economy and organised crime, Italy, mafia and tagged 'ndrangheta, corruption, illegal economy, journalists, organized crime. Bookmark the permalink.